"After your 1986 divorce from Pat, how did you handle your depression?" "I turned to dancing as my salvation. This led to one of the most unusual sagas of my life, a story known as The Streak. Oddly enough, this curious tale is also very important to the history of the studio. It is closely related to my tale of the Third Generation and to the origins of my studio's reputation as a marriage factory. After the Slap fight, for the next several months I played the part of the wounded bear. Other than teaching my dance classes, I kept completely to myself. I would leave dance class immediately and come home to my empty house. Not only was I angry that the truth behind the beating episode had been flipped, I was angry at a lot of my friends for siding with Pat. No one had come to my defense with the details of what really happened. I was really bitter. Sometimes I'd cry, sometimes I would stare at the TV, sometimes I would just sit there in the dark and brood. I was in the grips of a powerful depression. Divorce has a way of doing that to you. Those were the dark nights of my soul. One Saturday night in June I thought I was coming pretty close to losing it. It had been two months since the fight, but I was still consumed with depression. I had been doing private dance lessons all day and had come home to get a bite to eat. As evening turned into night, I continued to sit at my dinner table. I was too paralyzed to even get up and turn on a light. The summer twilight kept the place barely lit. As the shadows loomed around me, I felt very shaky in my solitude. I kept staring at the four walls of my Haunted House. Inside my brain, it was a dark and stormy night. Thoughts of shame, bitterness and regret crept to the edge of my brain like a pack of wolves slowly surrounding their prey before the attack. I wasn't in the mood to fight these demons tonight, but the demons were in no mood to leave me alone either. I knew I was in danger. Sooner or later, those dark thoughts would come calling. I decided I had to escape my demons and loneliness. I figured I had 3 choices - Drugs, alcohol, or go dancing. The dancing seemed like the best alternative even though it meant facing some of the people who had sided with Pat. I didn't relish facing more humiliation, but I didn't have much choice - I had to get out of this place or risk going mad. So I got in the car and went to a club called Twiggs to dance the Whip. Sure enough, some of Pat's friends were there. But after one look at the expression on my face, they glanced away. Margie Saibara was there. She looked up and gave me a smile. She was a witness to the slapping incident, so her smile made me guess she had not accepted the lies. So I went and sat down next to her. Margie didn't say anything past 'hi', but that was fine with me. I just was glad she was willing to let a leper sit next to her. After awhile, Margie asked me if I wanted to dance. That broke the ice. We got out and danced the Whip. After that, I danced periodically through the night. Interestingly, no one spoke to me about youknowwhat. The Curse of Pat continued to hang over me like a dagger. I can't say that Saturday night of dancing at Twiggs completely lifted my depression, but the dancing definitely got me through the night. Encouraged, I decided to try the same trick the next night. It was Sunday evening. I had heard a place called The Four Palms had a blues band known as the Soul Brothers, so I drove across town to dance the Whip again. Anything to avoid staying in that lonely house at night. The dancing worked its charm again. I remember actually smiling on my way home. Monday I taught classes at the studio. When class was over, I invited some the people in my class to go out dancing with me. I did it again the next night, the night after that, and so on. My Whip dancing at night kept the inner demons at bay. That's all I cared about. Without really giving it any thought, dancing Whip after class became a nightly ritual. After a month, I realized that I had unconsciously stumbled upon 'dancing' as my self-therapy. 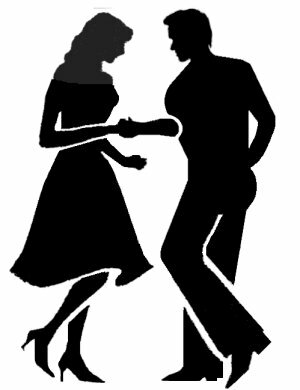 The nightly dancing had worked so well, I didn't see any point in quitting. So I continued to dance every night after class. I would eventually go Whip dancing every night after class for 201 nights in a row. During this span of time, my unusual self-help dance program worked an absolute miracle on me. I never took a pill, I never saw a therapist, and I never went one drop past social drinking. Indeed, when I finally decided to stop at the end of 1986, I was probably happier than I had ever been in my entire life. My dancing had improved, I felt attractive again, and I had more friends than at any other time in my entire life. Whip dancing had enabled me to crawl out of the deepest depression of my life. "What did you learn from your Streak of dancing?" "I wish I had trusted my friends more. It turned out that only three or four people actually sided with Pat. But I didn't know that because I cut myself off from everyone. I was so wounded by the things I initially heard that imagined everyone thought the divorce was my fault. I would say my Achilles Heel is trust. I rejected everyone and retreated to my lair. There I brooded over my feelings of betrayal. The thought that my friends had deserted me was unfounded, but I never had the guts to find out what the truth was. In the meantime, the loneliness began to eat me alive. I didn't start my road back to recovery until I reconnected with my friends. From that point on, they reached out and carried me until I snapped back to my senses. The other lesson I learned from the Streak (my term for the 201 Nights) was that for Dance to work its Magic, you have to PARTICIPATE. The healing waters of Dancing will not work if you sit at home and brood like I did. You must force yourself to get out there. You must take a step. You must move. And you must PARTICIPATE with other people. Once you take that step... one step, two steps, three steps... it doesn't matter... the members of the dance community will reach out to you and bring you back into the world. But first you have to put yourself in front of them for them to help you. You cannot expect them to knock on your door and do things for you. Do not cut yourself off. Get out there. Cutting myself off was my big mistake. By cutting myself off from my friends, I had no way of knowing how badly they hurt for me. But they were scared to death to approach me. 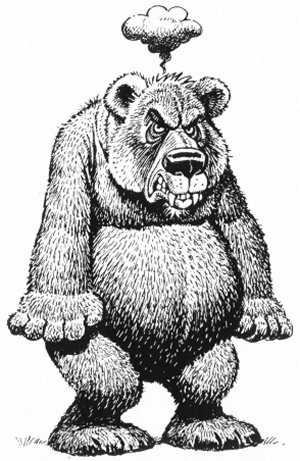 They knew how bad my temper was. Which side of Rick would answer the phone?" "After the Slap Fight, Pat somehow disappeared from my dance circles. Even though she won the PR war, she vacated my dance world, probably because another man was waiting in the wings. She turned her attention to him. 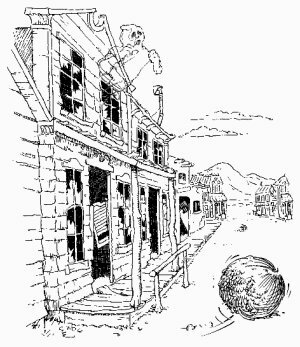 Towards the bitter end, one night I remember noticing how intently a man named Bill was watching Pat dance at Cooter's. It was one of the nights when the group went over there. Pat went on to marry him not long after our divorce. She also continued dancing. She was a very good dancer. Pat went on to win a City Championship with her Whip dancing. I don't know how she avoided me considering she continued to dance here in Houston, but I only recall seeing Pat for two brief moments over the next twenty years. One time was in 1988 after some mutual friend's wedding. I did not know she would be there. After the ceremony as I was leaving, by coincidence I ran smack dab into Pat in a distant hallway. She smiled at me and showed off her two young boys. Handsome kids. She had a right to be proud. It was a cordial moment. In 2001 after my divorce to my second wife, one night I decided it was time to get back out in the world again. Unlike the first divorce, I was sad, but I wasn't devastated. I just wanted to get on with things. 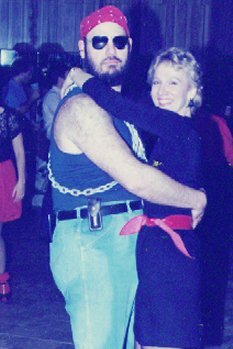 Thinking back to 1986, I remembered how good Whip dancing had been for me. So on a Friday night after I finished with dance class, I went over to Melody Lane to dance the Whip at some event. Amazingly, the first woman I saw when I entered the room was Pat. I had heard she was divorced again, but I was still completely taken off guard. Pat was standing alone. She politely said hello. I said hello back, then ran for sanctuary on the other side of the room before she could think of something to argue about. When I got the courage to look back, she was gone. For a fleeting moment, I had thought I might ask her to dance. But I guess she didn't want to see me any more than I wanted to see her. "So how did your 201 Nights of Dancing relate to the Third Generation and studio weddings?" "The Third Generation had more or less begun when I got married to Pat. The Third Generation was still there when my marriage ended. 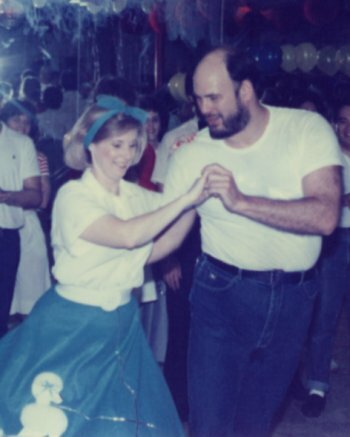 I have always felt like my 1986 Dance Streak was the high point of the Third Generation. After I ended my two-month depression and showed back up on the dance scene, the same people who had witnessed my battering stood by me and propped me up. The women danced with me and talked with me. The men told me to hang in there. So did the women. Each of them begged me to go dancing with them here or dancing with them there. They could see I needed help, so my friends made a point to be sure I was included in everything. During this crazy year 1986, several members of the Third Generation became the people I was closest to in my entire life. I would say my two best friends today are Mike Fagan and Tom Easley. Both men go all the way back to those days twenty years ago. On many nights, they were dancing right along beside me. That was a very very special time in my life. And the women were just as kind. Margie Saibara, Diane Head, Carol Gafford, Michelle Collins, and Diane Stotz were always there. All these people - add Ted Jones in there as well - became my constant companions as I traveled my strange road back to health. A funny thing happened along the way. After dancing every night of the week for several months, one day I realized that I was actually beginning to improve as a dancer! Mind you, I wasn't out there because I loved dancing. Hell, no. I liked to teach a heck of a lot more than I liked to dance. I was out there because I didn't trust myself to be alone anymore. I remember how scared I had been of losing control on that dark night of the soul back in June. I wasn't just a little scared that night, I had been scared out of my wits by my inner demons. I thought I was on the edge of going crazy. Those dark thoughts were gone now thanks to the support of my friends and the therapeutic movement of dance. In the meantime, I was starting to get a lot of compliments on my dancing. And these compliments were coming from the right place - I was hearing praise from the pretty girls who were my friends! They said my leads were incredible and that I was really fun to dance with. These compliments were exactly what I needed. Soon my self-esteem began to return. I rejoined the land of the living. Now I threw myself into this accidental dance self-improvement plan with a vengeance. I had never been a great dancer before in my life, but I could see that thanks to all this practice I was on the road to becoming very good. Far more important, along the way I had resumed my previous role as 'Leader of the Pack'. I was back." "Tell me more about the Third SSQQ Generation." 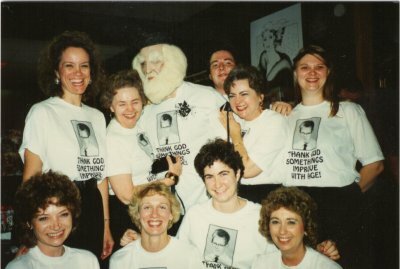 "For starters, in August 1986, I organized the most amazing practical joke on my friend Tom Easley. I won't say another word about it. I don't have to. One look at the pictures is worth 5,000 words. On the other hand, if you are crazy enough to dare read the story, be my guest. Be careful, it is the story of a descent into group madness! It is not for the squeamish. The Tom Easley Look-a-Like Night "
"So what were the other people doing during your 201 Nights of Dancing?" "Now that I was Leader of the Pack again, a Leader has to have Followers, right? And I really did go out dancing EVERY NIGHT for 201 nights in a row. There was no fudging. So what do you suppose this amazing cast of loonies was doing each night? Take a wild guess! That's right, they were out there dancing with me. Yes, of course, the others lacked my commitment and dedication so they took a night off now and then, but believe me, the group put in a lot of serious floor time that year. And if I was getting pretty good at this dancing stuff, guess what, so were they!! They were a Band of Lunatics and I was one the Head Crazies... please note that a simple glance at the pictures above shows I clearly had plenty of company! I still have a hard time figuring out how people that nuts helped me become sane again. After all that dancing, some of the people got really good. For example, take another look at those pictures up there. Mike Fagan became a State Champion Whip Dancer. 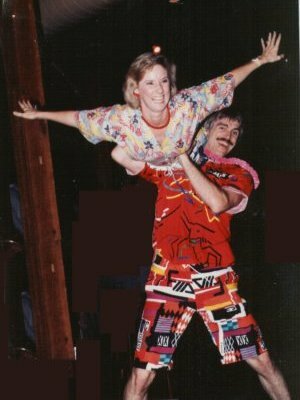 Tom Easley entered several contests and did pretty well himself competing with his upside down friend Carol Gafford. 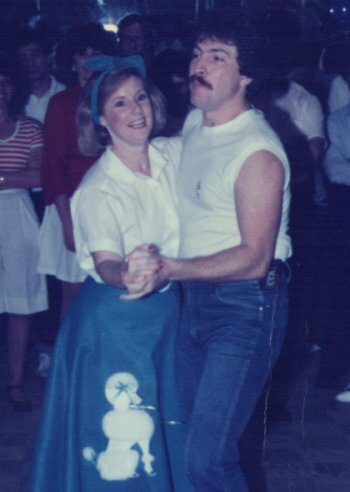 Ted Jones and Margie Saibara became Texas State Dance Champions as well. So one immediate benefit of the Streak as I called it was that the whole group became phenomenal dancers in 1986. Another benefit was the size of our group swelled to probably 80-100 people. On the night of the Look-a-Like event, we must have had 50 people dancing at the Safari Bar that night. This was the Third Generation, a group that became inseparable. Tom and Carol organized Surfside Weekends, we took trips to the Bahamas, took ski trips, had weekend volleyball games, you name it. As people would discover the studio, they took one look at the kind of fun we were having and would instantly hitch their wagon onto to our momentum. The studio was hot hot hot. And so was SSQQ Slow Dance and Romance. Out of this group of people, there were at least a DOZEN SSQQ marriages from the Third Generation, probably even more than I can't remember. Tom Easley met his wife Margaret at the studio. They will be celebrating their twentieth anniversary soon. 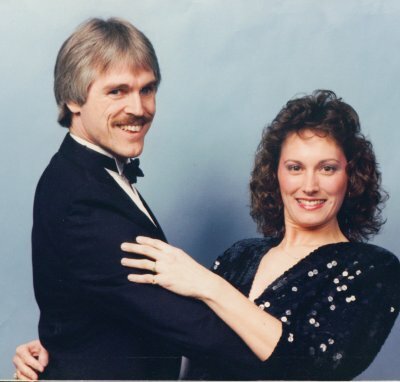 Mike Fagan met his first wife Lisa at the studio. Diane Head and Ken Paar. Irving Carter and Sharon Winters. Jim Smith and Pat Wilkins. Did I mention we were all having the best time of our entire lives in the process? Not only that, there was a whole new group of people joining the studio at the same time!" "That is a lot of marriages. How did you keep track?" "Pictures. If you got your picture taken, my memory might be jogged. I imagine there were other marriages from those days I don't even have a clue about. There were so many couples that got married I get angry with myself for not making notes. Take for example the story of Judy Horton and Scott Lee. 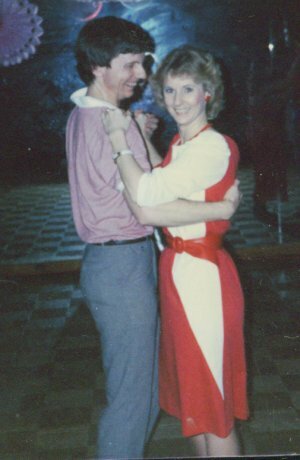 Their marriage is a perfect example of an Eighties marriage that totally slipped my memory: Judy and Scott were a big part of the Western crowd that went to Texas and later on to Midnight Rodeo in the mid-80s. I knew both Scott and Judy by name, but I did not know either of them on a personal basis. I do remember they were definitely a cute couple. I had forgotten about them until by chance in 2006 I got a very special letter from Judy (Horton) Lee. I was so touched I had to share the story. My name is Judy Lee, maiden name Judy Horton. 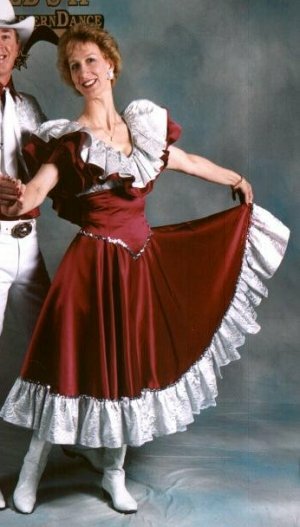 I'm sure you don't remember me, but I took classes from SSQQ (western swing, whip, and swing/jitterbug) back in 1985-86. Irving Carter and I used to coordinate practice sessions at different clubs around town. We called ourselves "The Friday Night Clique." I met my husband Scott in the intermediate western swing class. I had already taken the class and was helping out, because you needed women in the class, and you needed someone who already knew the moves to help the teacher (Judy Price, the other Judy) show the steps to the class. Any of this sound familiar? Scott and I (and our two boys) are now living in northern Virginia. Let everyone know we will be in Houston over the July 4th Holiday to say hi to our old friends! The tall one on the left is David, who's 16. Jake is the smiling blond on the right, and he's 13. (Yes, blond! There are blonds on Scott's side of the family.) And the lovely and handsome couple in the middle is Scott and me (lovely for me, handsome for him!). A major point of this story is I that missed mentioning Scott and Judy when I wrote the original Matchmaker story in 2006. 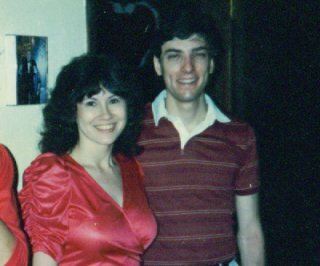 After Judy was nice enough to contact me, I was able to not only add her story to my 2007 update, I even found two wonderful pictures from Scott and Judy's days at SSQQ. I am sure Judy will be thrilled to have her picture displayed with Mr. Look-a-like himself, Tom Easley. One more point - I am really proud to have been a part of the lives of Scott and Judy Lee. "When did the Fourth Generation begin?" "Three things happened in 1987 that led to the creation of the Fourth Generation which I also called the Studebaker's Generation. First, SSQQ acquired more space. Since 1980, we had rented just a couple rooms from Dance Arts. But once Dance Arts went out of business, SSQQ acquired all the space. Not only did we expand from two classes a night to five classes a night, we were now able to establish regular Practice Nights right at the studio after class. Practicing at the studio was so convenient that everyone stayed after class and danced the night away. Practice Nights were not only marvelously popular as a way to improve, but the pace of the Birds and Bees picked up considerably as well. 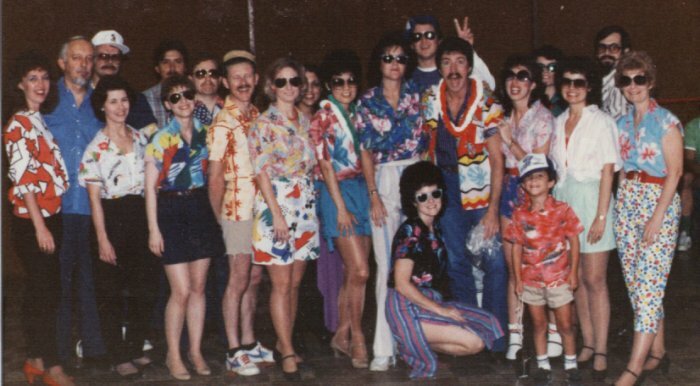 Second, in 1987 an ultra cool dance club known as Studebakers opened up in the Galleria area. 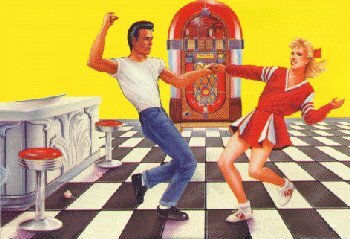 Specializing in 50s and 60s music, Studebakers had a great dance floor. Our group of SSQQ Swing and Whip dancers met there on a regular basis for a great evening of dancing. Not surprisingly, Swing classes were really hot that year at SSQQ. Not only did we love dancing to the music of our youth, the place was packed with businessmen and good-looking businesswomen. These people became our audience. They would watch us dance and clap. We of course enjoyed the attention. SSQQ became the entertainment whenever we went there as everyone loved to watch us dance. As a result, we felt like the Stars whenever we went to Studebakers. With our great dancing, we definitely became the main attraction. The businessmen would buy our ladies drinks and our guys would flirt with the pretty waitresses. Even better they would exchange glances with the well-heeled unattached women who enjoyed watching them dance from afar. Occasionally the brave among us would even head over to one of these women and ask them to dance. Not surprisingly, the regulars at Studebakers not only turned into great dancers due to all that practice, they also began to develop very close friendships. It was these friendships that resulted in the formation of the Fourth Generation of dancers aka the Studebakers Generation. In addition, practically all of the important SSQQ instructors in the Nineties came from this Studebakers Generation. Maureen Brunetti, Susie Allen, Donna Ruth, Judy Stidham, Ben Liles, and Linda Rooks were all card-carrying members of the Studebaker Gang. Diane became an instructor the hard way - I threw her to the wolves. One day in 1987 long-time instructor Judy Price suddenly quit. On the spot, Diane suddenly got promoted from Swing student to Swing instructor. Her first class was in two days! Diane didn't have a clue what she was doing. Being a woman, she had no idea how to teach the men how to lead or what their footwork was. One Saturday morning, I arrived early at the studio for my lesson with Diane. I heard some Swing music in a far room. Curious, I went over to peek. In one of the funniest moments I have ever seen, I saw Diane dancing with her two teenage boys (12 and 14) at the studio. Something seemed wrong so I looked more carefully. That's when I realized Diane was the "Lead" and the boys were dancing the "Follow". In other words, the boys were dancing the girl's part. Blissfully unaware they were dancing the girl's part, they were having a great time! Diane desperately needed to practice and this was her solution. In fact, she needed their help so badly, she didn't dare risk telling them the truth. She could not take the chance of having them say "no". I had to smile because the boys seemed to absolutely love dancing with their mother! Sad to say, Diane probably was doing the right thing by not telling the boys the whole story. One day the boys accidentally found out the truth. They got madder than hornets at their Mom. So much for her Practice Partners. Both boys felt humiliated. They refused to ever dance with her again. True story. What makes Diane's story more notable is that despite her obvious lack of experience as a dance teacher, her Swing classes were huge! Her students signed up for each new level Diane taught at a rate that was nearly 100%. Diane's secret was Practice Night. First she had the amazing ability to get practically her whole class to stay. I don't know how she did it, but she did. Her second trick was that Diane was a born teacher. She wanted every one of her students to get better. Even though Diane BARELY knew more than the men she was teaching, she was phenomenal at helping her male students during Practice Night. She would dance with every man as often as she could. If they made a mistake, she would correct it on the spot. For example, if they hurt her, Diane had a way of fixing it. Or if they were too fast or too slow, Diane would count for them until they found the beat. Diane didn't always KNOW what the guy had done wrong, but she did know when it didn't feel right. She would ask the guy to try a move again until she could figure out what was wrong. Most importantly, Diane had a gift for explaining mistakes to men in a way that never hurt their feelings. She found some magic role as part Sister/ part Mom/ part Best Friend that allowed her to correct the men without making them defensive. Rather than argue like most men do, they listened to her. In fact, they learned to seek her out during Practice Night to get tips. Usually the men would improve gradually. However sometimes the improvement would be so dramatic after just one Practice Night dance, later on the women would come up and compliment Diane on the improvements they had seen in their husbands/boyfriends. The women loved Diane because she was turning out great dancers who had miraculously developed rhythm and good leads. Plus all that practice had locked the patterns from class into their muscle memory. Best of all, the men learned how to be gentle and never hurt them! Diane became a huge heroine to the women who sang her praises to me constantly. This led to another important development. By practicing together, over time everyone in the class became friends with each other. They signed up for each new class just as much to continue to hang out with their friends. Plus they wouldn't dream of leaving their leader. They signed up for every class Diane offered as a GROUP because they loved her so much. No one could ever have predicted Diane's success ahead of time. Diane was a good social dancer, but definitely not a competition dancer. Her technical knowledge of dance was limited. She had never had a private lesson in her life. Her day job was secretarial work. Nor did Diane have a college degree. Diane was smart, but not well educated. What Diane did have was the biggest heart in the world. She radiated warmth and concern. 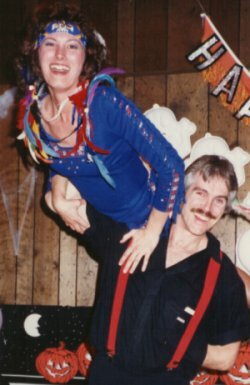 Diane Head was the woman who taught me that for a Social Dance Studio like SSQQ, a big heart is more valuable than technical expertise. I agree that dance technique is important, but not till the higher levels. At the Beginner levels where Diane started, her ability to MOTIVATE students proved to be far more valuable. For many of the people who took classes here, Diane Head was totally effective. Diane's story clearly illustrates that the combination of Practice Night and a big heart are the elements that drive our success at SSQQ. The appearance of Practice Night, the success of Studebakers, and the genius of Diane Head were the three factors that created the Studebaker Generation." "How close were you to the new Studebaker's Group?" "That is an odd question. You must have sensed something. 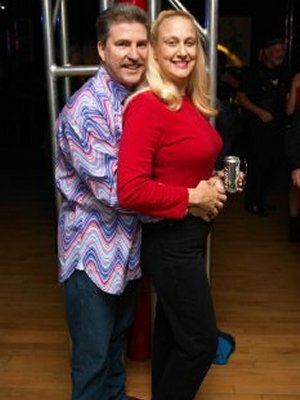 I really enjoyed going dancing at Studebakers. I mean, every adult believes that the music of his youth is the greatest music ever recorded. As a result, our Baby Boomer Crowd was reliving Memory Lane every time "Mustang Sally" or "R-E-S-P-E-C-T" rang out. It was delicious fun. That said, the people I danced with at Studebakers felt like they were my students even though they were the same age as my Third Generation buddies. I was always curious about the distinction. For the first time, I was seen more as a teacher than a member of the group. It may have been the vibes I was putting out, but this was significant development. I was putting space between myself and my dance students. Plus the studio had expanded so dramatically that it was impossible to know everyone on a first hand basis as I had back in the previous eras. There was definitely a change here. Another reason I never totally warmed up to the Studebakers people was due to my personal problems. I was suffering from a serious depression at the time related to the disappearance of several members of the Third Generation. The Third Generation by and large completely ignored Studebakers. In fact, I rarely saw these people any more and I really missed them. Bob and Louise were gone. Mike and Tom weren't around much any more. Even Ted and Margie were absent. I first wrote about this amazing group in article called "Where the Creatures Meet". I wrote more about them in a follow-up to the "LookaLike" story. This group of people grew so close that many of the members still see each other today. They like to stage yearly Big Chill-style Reunions. The favorite reunion event is their annual ski trip together around Super Bowl time. They usually meet in the summer at Tom and Margaret Easley's (pictured at right) house for Tom's birthday party. And dinner get-togethers are common throughout the year. Plus I think Ted and Margie will soon be celebrating their twentieth anniversary of being the longest unmarried couple in history. This group touched my heart in ways too profound to completely express. All I guess I need to say is that I loved them very much back in the Eighties and I still do today. They are a huge part of my memories. It's too bad they had to break my heart." "How did they break your heart?" "That's easy to answer. They all left the studio! One by one over a span of three years, I lost probably 70 people for four different reasons, none of which had a thing to do with me. It is very easy to explain, but at the time it was very difficult to accept. Along with me, Tom, Margaret, Mike, Ted, Carol, and Margie were also the leaders of our group. After all the dancing they done in 1986, these guys were very good dancers in their own right. By 1987, they had become such good dancers, they decided they wanted to enter the world of competitive dancing. Unfortunately the biggest name in town when it came to competitive dancing - Mario Robau - was over at the Southwest Whip Club. I didn't teach competition dancing, just social Whip dancing. The die was cast. Other than Diane Head, the entire core group of Whip dancers - Mike, Tom, Margaret, Ted, Margie, Carol - went over there to train under Mario. I knew what they were doing and I understood. They left with my blessings. The problem was that they accidentally took everyone else with them as well! None of us had any way of anticipating that the second and third tiers of dancers in our Look-a-Like Group would follow their lead and leave too. But sure enough, lo and behold, half my Third Generation group followed them over to Southwest! The thinking was pretty simple. If Ted, Tom, Carol, and Margie thought Mario's class was the place to be, then that's where they needed to be too. Once Ted-Margie-Tom-Mike-Carol realized what had happened, they weren't in any position to close the barn doors after the cows got out. One by one, my once mighty Martian Whip class began to suspiciously dwindle. It didn't take me long to figure out what was happening. There wasn't a thing I could do about it. People I had been training for months and years were suddenly gone due to the herd instinct. I lost practically my entire Martian Whip class. Not surprisingly, I was very bitter. I was a very good Whip teacher, but Mario was better. Tough luck. That's life. Big fish get eaten by bigger fish all the time. Although I didn't enjoy being a Happy Meal, I understood that these people had a right to pursue their dreams. That didn't mean it was easy to accept. The Exodus to Southwest hurt the most because these people were not only students, they were friends. Equally painful was a new 'Marriage is the Death of Dance' phase. As I have said previously, once people get married, dance suddenly takes a back seat. The energy from the past few years was paying off. People from the Third Generation group began to get married right and left. Marriage eliminated at least a dozen key couples. Each time a couple got married, they slowly but surely began to ease their way out of the picture. Stan and Pam Clark, Doug and Sharon Hollingsworth, Chuck and Laurie Gray all moved on. So did Charlie and Beverly Roberts, Irving and Sharon Carter. These people were nice enough to return to my dance parties once or twice a year, but for the day-to-day workings of the studio, they were gone. Then the Houston economy went south. Oh my gosh, people started leaving the city in droves to find employment in the late 1980s. The employment crunch must have taken at least another 20 people! No one was spared. I agonized over the important people who were forced to leave due to employment problems. I had to watch helplessly as they left. Jim Ponder, Hilary Mears, Debbie Oswald, Chuck Clayton, Juan and Julia Meza, Craig Mason, Jim Garrison, Bill Stumph and his wife Diane, Rilla and Valerie Ryan, Bob Job and Louise Campodonico, Pat Wilkins... And so many more!!! Most of those names were people who had been with me for YEARS all the way back to the Winchester Days of the early 80s. They were literally my best friends and now they were dropping like an epidemic had hit the studio. But the cruelest blow of all was when I lost two incredible leaders at once. Both Jim Smith and Diane Head had to move to Dallas. Houston's lousy economy ripped both Jim and Diane away from me. 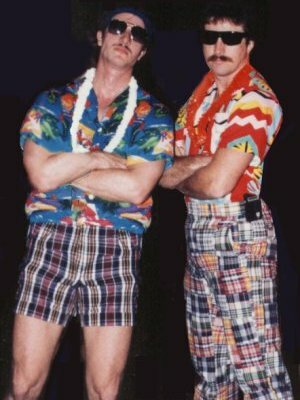 After Tom Easley and the rest of the Look-a-Likes had moved over to Southwest Whip, Jim and Diane had moved forward to fill the vacuum. They had become the two most popular people at the studio. 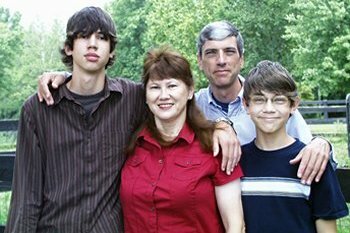 Jim and Diane were the heart of the Fourth Generation, but now they were gone. If I had been bitter before about losing the Whip crowd or bitter about Marriage is the Death of Dance and the Economy taking people away, the loss of my two close friends was literally the blow that finished me off. 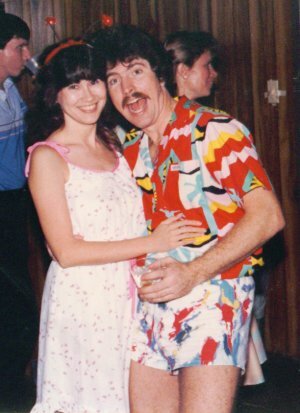 Diane Head had met Ken Parr at the studio's 1987/88 New Year's Eve Party. They fell in love that night and began a whirlwind romance. They were soon married which was good news for Diane, but bad news for me because Ken's oil company had just transferred him to Dallas. The identical thing happened to Jim Smith. He had just married to his SSQQ sweetheart Pat Wilkins when Marathon Oil said his Houston-based job had been moved to their Dallas office. Good jobs weren't that easy to come by. Jim had to go. The twin losses of Diane and Jim could not have been more than a couple months apart. Losing them hurt so much. Personally, I loved both people. Professionally, they were my top two Swing teachers. For years since, I have secretly nursed a hope that one or both would return, but sorry to say, I have never seen them since. Gosh I miss those guys! Add it up - that's more than 80 people. It wasn't just that one-fifth of my student base left me, these numbers included my closest friends. I would say two-thirds of my huge Third Generation group were wiped out right there. It was like a plague had hit the studio! I could have handled it if Jim and Diane hadn't left. Losing Jim and Diane was the toughest blow of all. I was miserable. I felt like one of the 'Left Behinds'. I was very depressed." "What about the remaining people? You said some of the people weren't affected. Couldn't you rebuild with them?" "Actually I lost the remaining third of the Third Generation as well. It is a very odd phenomenon to explain, but here is how it went. After Southwest Whip took the cream of the crop, there were still plenty of people left who had hung with the In-Crowd at various times. These people were more like 'part-timers' at the studio. For every leader, there has to be a follower, right? These part-timers were people who would take a class, meet someone, date a while, break up, then come back. I guess you would call them the 'Followers' of the In-Crowd. They weren't around often enough to make the inner circle, but they considered themselves part of the group nonetheless. They were on the edge of the Group. From time to time, every single member of the part-timers would periodically show up for various events looking to reconnect to the Group. The part-timers would show up for a class or a party, take a look around, then ask, "Where is everybody?" It broke my heart to tell them the Gang wasn't coming that night. They were it. Disappointed, the person or the couple would hang around for a while in shock. Maybe they would dance one dance since they were already here at the studio. Then when they were pretty sure I wasn't looking, they would quietly disappear. They didn't come back a second time. 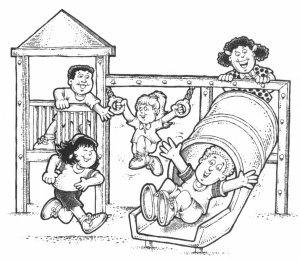 The playground isn't any fun without your friends. So that is how I lost the final third of the group. If they were a good dancer, they would go find the Exodus Group over at Southwest Whip. The rest would drop out of the dance scene entirely. After all the fun they had with the Third Generation people, it was too awkward for them to make the effort to adjust to the new faces at the studio and start over. Maybe it was time to look for another hobby. In 1988, with very few exceptions, I suppose I lost the entire Third Generation in the space of a year. Once the Core Group moved over to Southwest, the established heart of the studio was gone. They left a huge vacuum. Oddly enough, I didn't lose any money. Nor did the studio suffer really. The studio was actually bigger attendance-wise than it ever had been. The newcomers didn't care, they just joined the emerging Studebaker Crowd and followed the leaders of the newly-forming Fourth Generation. But to me personally, the loss of my Third Generation friends was just as serious as a death in the family. I was in mourning." "Surely they didn't desert you, did they? Didn't they at least come back for the Sock Hop or the Halloween Party?" "Heaven's no! No one 'deserted' me. It just felt that way! If any of these people ever read this story, let me make it clear that no one departed on bad terms. The people who I am thinking of as I write this story have always been unfailingly kind to me whenever our paths have crossed in the years since. We are all on friendly terms and I am always happy to be reunited. Any mature person would understand they all had a perfectly good reason to go. Like I said, they had own destiny to follow! Especially the Core Group. Thanks to my 201 Nights of Dancing, I had helped get lots of people hooked on Whip Dancing. 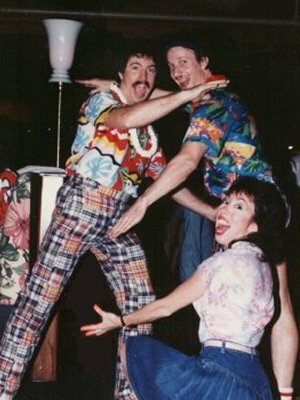 Many of my friends from that crazy 1986 adventure had practiced so much that they had joined the ranks among the finest dancers in the entire city. Dancing was their love, their hobby. They had every right to pursue their dreams. If they hadn't left, they would never have become dance champions. I didn't blame them at all. Heck, I would have gone with them if I could, but I had a certain night job." "Here is picture where the Third Generation and the Fourth Generation came together. 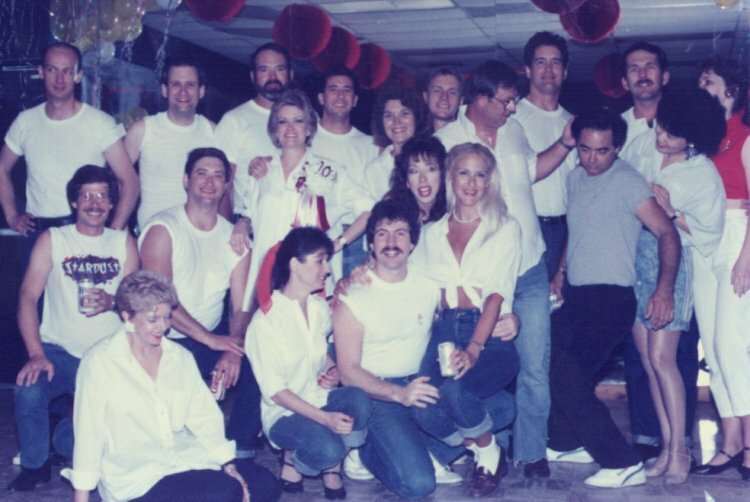 This picture was taken at Diane Head's 1988 Going-Away Party. It should be obvious no one deserted me - there's Tom, Carol, and Margaret right in front, Alan Brown and Margie Saibara on the right, Irving, Charlie, and Dan Taft in the background. These people and many other members of the Third Generation group came to Diane's party to say goodbye to her. After all, Diane Head had been a card-carrying Third Generation member of the highest degree. Diane and Margie had been with me so long they had both started as Second Generation people before my marriage to Pat. Half the picture is filled with the new Fourth Generation people. But you know what? I don't know their names. I was so upset by the loss of my friends that I was unable to bond with the new Fourth Generation. I kept my distance. I was full of sorrow the entire night of Diane Head's Goodbye Party. Diane and her friend Margie had been leaders of the Group during my ill-fated marriage back in 1984-1985. 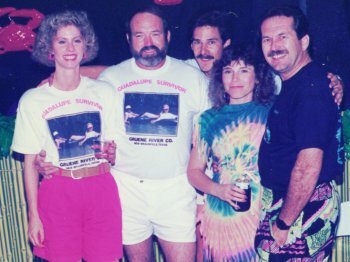 Then in 1986 during the 201 Night Streak, both Diane and Margie were front and center of everything we did. After Judy Price left in 1987, Diane and Margie stepped up to fill the leadership vacuum. 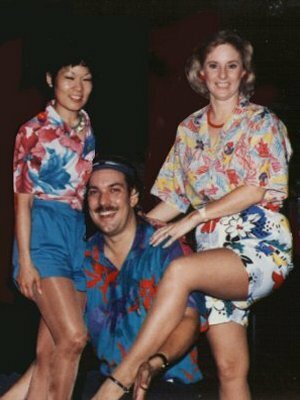 Diane and Margie became the Twin Pillars of the studio for several years, acting as hostesses at all the events. These two women became marvelous leaders. But as of this party, now Diane and Margie were both gone. And so were the Exodus Core Group. In addition I had lost my Martian Whip class. I wanted all of them back!! It burned my soul that my entire advanced Whip program was functioning intact over at Southwest Whip. I think in a way, Tom/Mike et al felt a little guilty that their private decision had triggered a mass defection, but there wasn't much they could do about it. I felt like the odd man out. Heck, I was the Odd Man Out! I was Mr. Left Behind! What was I going to do, quit my job as a dance teacher and go over to join Mario's dance team so I could be with my friends at night? Of course not. But I wanted to. It didn't help that I kept hearing through the Grapevine what a great time my friends were having together. As a group, they had joined a performing dance team that was 75% ex-SSQQ, they entered dance contests, they got advanced training, they traveled to other cities for workshops and performances, you name it, they did it. If anything, the Exodus Core Group grew closer as if that were even remotely possible. Meanwhile I felt like the exile watching from afar through the window as my friends celebrated their love for each other in the tavern on a snowy night. I was once their leader. Now I was an outsider. But end they did. Those days were gone. And I wasn't handling it very well. I wasn't bitter at any particular person. I was simply bitter at my tough luck. I had built a terrific Whip dance program at SSQQ only to see it walk intact over to another studio. Every single one of my top dancers except one person either jumped ship, got married, or left town. The glory of the 201 Nights of Whip Dancing was long gone. Financially, it was a drop in the bucket, but spiritually it crippled me. I mean, the Universe had blessed me with one incredible break after another during Saturday Night Fever and Urban Cowboy, but you know, in every life there has to be some hard lessons along the way. Apparently after all those early breaks and blessings, my good luck had run out. I suppose the Breaks have to even out, but that doesn't stop it from hurting." "You said 'Everybody except one person'?" "Sharon Crawford was literally the 'Last Person Standing'. She was the only leader left. Sharon remains my last surviving link to the glorious past of the Eighties. That is why I love her so much. She became the closest thing to a sister I have ever had. Sharon Crawford came to the studio in 1987, the year after my 201 Night Streak. A former Kilgore Rangerette, Sharon was a marvelous natural dancer. She picked up everything so quickly. Due to her unbelievable dancing ability, she immediately fit right in with the elite dance crowd. Even though she was a rookie, she caught up to their level in a hurry. However since she had missed the Streak in the previous year, Sharon didn't bond quite as strongly as all the others. So when the Exodus group went over to Southwest, Sharon decided to stick around and take some more classes from me. Thank goodness she stayed. Sharon Crawford saved me from going mad!" "How did Sharon come to the rescue?" Previously I mentioned that we acquired more space in 1987. Things grew very weird at the studio in late 1987. My long-time dance teacher (and landlord) Glen Hunsucker started to treat me very badly. I didn't understand why at the time, but I later learned what the problem was. It turns out that without my knowing, Glen had developed a serious chemical dependency. He took my rent check each month and used it to pay for his drugs. One day in October 1987, I showed up at the studio only to find the doors padlocked. Glen had been evicted... and so had I.
I wrote down the phone number of the realty company and contacted them the next day about taking over the space. They were very reluctant to do business with me because they assumed I was fronting for Glen to sneak him back into the building. Finally I had an idea. What if I could prove his operation and mine were totally separate? Would that make a difference? The man reconsidered. He asked me how I was going to prove that. I smiled and said that was easy. All I had to do was show my rent checks to Glen for the previous seven years and how I had never missed a payment. That would show that I was paying the entire time and that the money wasn't getting to them because Glen had diverted it. So that's how I took over the studio. I had been using two of the five rooms each night. But assuming full control meant I went from two classes a night to five classes a night! Fortunately business was so strong that I could fill the space almost without blinking with all my Studebaker Generation students and 'parallel classes'. But I didn't have 21 new dance teachers! (3 extra rooms, 7 nights a week). That evening, Sharon Crawford showed up for her dance class. I told her she would begin teaching for me the following week when the next set of classes began. I didn't ask - I told her! 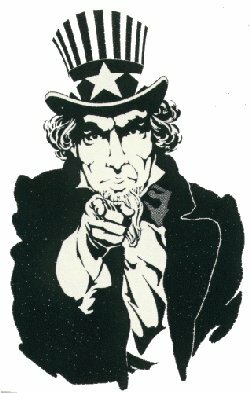 It was one of those 'Uncle Sam Needs You' kind of moments. I told Sharon I needed three more teachers and she was the obvious choice for one of the spots. Sharon turned white as a ghost. Nor was she alone. Diane Head got the same treatment and so did Jim Smith and a lady named Debbie Reynolds. Debbie had taught previously elsewhere, so she was already trained. Debbie came to work for me full-time. Jim and Diane stuck to the Swing classes. Sharon would teach Western. I threw poor Sharon to the wolves. We didn't have assistants and volunteers in those days. Sharon had never taught anything in her life. I spent some hours getting her ready on the side, but it wasn't enough. Sharon was so frightened in her first class she completely lost her voice. This led to an strange sight. 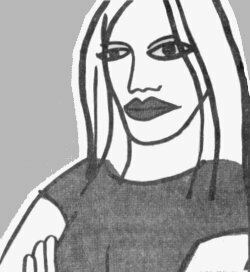 On that first night, I checked in on Sharon several times because I knew how worried she was. Late in the evening I peeked in and saw what resembled a football huddle with Sharon surrounded by her new students. At first I wondered if someone was hurt. So I went over to ask what was going on. One of the students said that Sharon had lost her voice and the only way they could hear what to do next was to huddle up!! Sharon looked up and tried to say something to me, but I couldn't hear a word she said. Maybe it was better that I couldn't hear what she was saying... she probably was telling me what a jerk I was for getting her into this mess. Sharon went through hell those first few months, but to her credit she hung in there. Soon she added other nights a week to her teaching duties. Because my studio had tripled in size, I now had this huge new studio. Seeing how overwhelmed I was, Sharon eventually quit her day job to help run the studio full-time. That was a good break for me. I don't see how I could have made it through my first year without her. Sharon was absolutely indispensable. "What happened after you took over the entire studio in 1987?" "The following year - 1988 - was like a Clint Eastwood movie, you know, good, bad, and ugly. The Good was that with Studebakers Swing crowd and the Western crowd, the studio had never been busier. I had my hands full trying to keep up with the expanded demands of running a five-room studio (as opposed to two rooms for the first ten years). The Bad was this was about the time the Exodus of the Core Group began. Everyone kept one foot in the studio and one foot over at Southwest for a while. They would take a class here and a class there. But eventually the day came when everyone threw their lot in with Southwest Whip for good. Like I said, I donated my entire Martian Whip class to Southwest Whip. I would estimate 30 dancers jumped over there. The Ugly was that I was miserable over their loss. And like I said, once the remaining part-timers from the Third Generation saw how the studio wasn't any fun without their friends, they left too. Then came the job migration that sent people to other cities. One by one, I had to say goodbye to so many people who had been my friends for years. Then came the toughest break of all when I lost Jim and Diane. I tore my hair out as Houston's failing economy and marriage attrition cost me all my remaining leaders save Sharon. Once Jim and Diane left, Sharon Crawford was the last person standing. Every time there was a disaster, there was Sharon to cover it. For example, guess how many Swing instructors I had? Two. Any idea what their names were? Yes, that's right, you got it - Jim and Diane. In the blink of an eyelash, I had lost not only my two best Swing teachers, I lost my only two Swing instructors. Who was going to take their place? Superman! Uh, make that Superwoman. Sharon turned white as a ghost. It was deja vu. I had done it to her again. But to Sharon's credit, she pulled it off. Sharon was pretty amazing. Despite my bad luck and my personal problems, thanks to Sharon the studio was doing well in those days. In fact SSQQ was doing very well. Attendance was strong. 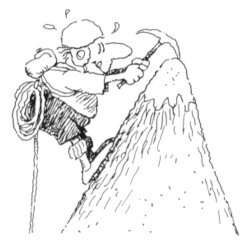 However without good instructors, the program would have come to a grinding halt. Sharon Crawford saved the day. Yes, thanks to Sharon, 1988 was probably the most successful financial year in studio history to date. 1988 was a year of one triumph after another. For example, the Sock Hop going-away party for Diane Head brought a crowd of way over 200 people. That was the Fourth Generation Studebaker crowd in action. The Sock Hop wasn't the only success either. 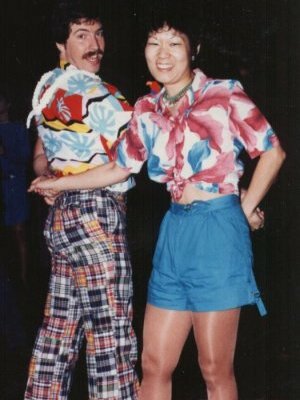 In the spring, Sharon and I debuted the first-ever "Sleazy Bar Whip Party." This clever idea had come from all the nights Sharon and I used to dance at the Rusty Bucket and the Four Palms back in 1987. After these clubs closed down, we thought it would fun to recreate the sordid days of the Whip. Despite the fact that the party got raided by the Bellaire Police (good story by the way), the party was a smashing success. 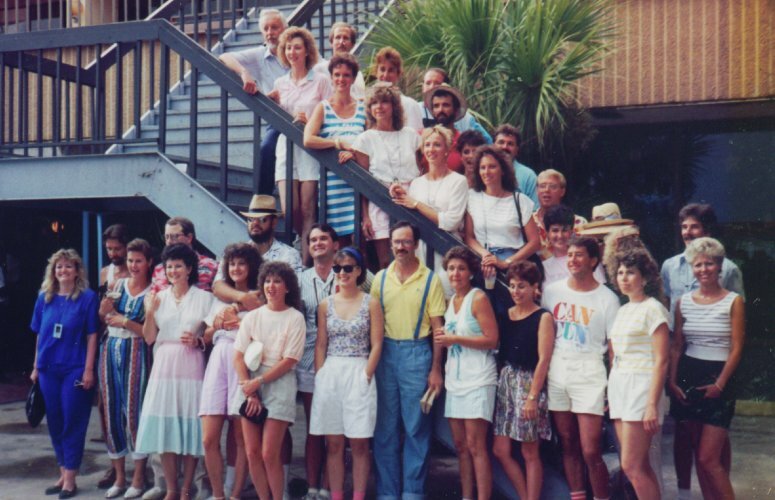 In the summer of 1988, Sharon organized an enormous trip to the Bahamas. More than 50 people joined us, including the whole Third Generation Gang. Sharon's summer trip was an incredible success. That fall, we had the biggest Halloween Party in history. The Studebakers Generation was in full swing in 1988. We set attendance records in our Swing classes that year that weren't broken for another ten years. 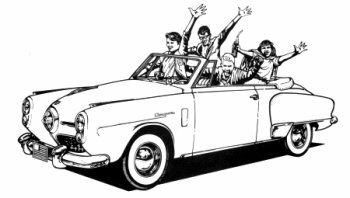 It wasn't until the crazy "Jump, Jive, and Wail" Gap commercial of 1998 brought waves and waves of Swing students through our door that the Studebaker Glory Days were finally eclipsed. Gee whiz. The studio was doing fine. It was me that was having the problems. Despite the outward success, I wasn't doing very well for a couple of reasons. 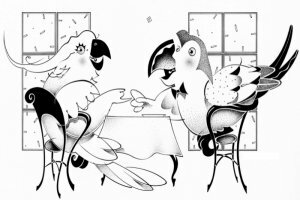 After my up-and-down Divorce/Streak year of 1986, in 1987 I screwed up my courage and decided to try a serious relationship again for the first time since my divorce. My 1987 relationship to a woman named Gail started off well, but she worked a 7 am day job and I worked nights. After a year of burning the candle at both ends, this poor woman found herself exhausted beyond belief. Gail decided to call it quits after the 1987 Halloween Party. She couldn't take it anymore. I think her parting words were something along the lines of 'I know I will miss you, but first I am going to take a nap.' Bless her heart. Gail was a good woman. I wish her well. Not long after my disappointment with Gail, at the end of 1987 I began to date a nurse named Janet who was taking lessons at the studio. Janet and I were well-matched. The first word that comes to mind is the word 'sharp'. Janet had a sharp mind and a sharp wit. Her sarcasm and my sarcasm blended well. We had a real connection. I thought this relationship had a good shot at going somewhere. Janet & Sharon Crawford became best friends. Thanks to these 2 women, I was in good hands. They kept me from going off the deep end when all the problems hit, but they couldn't shield me completely. 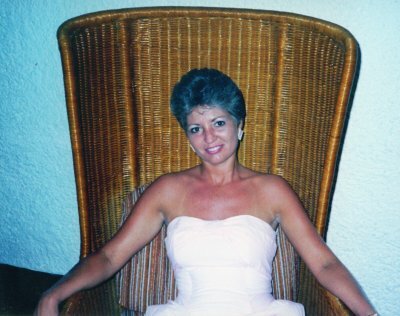 My sense of what I had lost began with Sharon's marvelous Bahama Mama trip in July 1988. Sharon did all the work organizing this trip; she was quite the social butterfly. This was a great studio adventure! The Bahamas Trip was bittersweet for me because the Third Generation Exodus had been completed. All my friends were long gone now, but the pain lingered. I was still nursing my wounds from losing all of my best friends. As long as they stayed out of sight, I was okay, but they were coming along in force for the Bahamas Trip. The Exodus Gang thought Sharon's Bahamas trip was a great idea! They signed up en masse. We had nearly 50 board on board for this one and half of them were Third Generation people. I was forced to share a plane trip and a full week with 25 people who had switched their loyalties to the other dance program. That is the trip when I first developed my 'nose in the window' feeling. Thank goodness Sharon and Janet were there - I spent most of my time with them because being around the Old Gang felt so awkward. I was already beginning to feel abandoned. Like I said, those were my feelings. There was no animosity on their part towards me at all. But I felt ill at ease with their tight-knit group because the pain of losing my best friends to my strongest business rival was such a tough pill to swallow. My mistake had been mixing my profession with my personal life. I had spent the past ten years finding my friends among my students. As a result, I had too much invested in these people. I was not only losing students, I was losing my friends as well. Adding to my personal woes, as 1988 turned into 1989, I knew my relationship to Janet wasn't going to work out. This was a real disappointment because I got along so well with Janet. The problem was her six-year old daughter didn't like me - she had a perfectly good Dad of her own. Nor did I approve of Janet's preference that I not discipline the child. Alone, Janet and I were fine, but you can't create a permanent relationship unless the triangle is solid. I could not foresee a relationship where I was forced to bite my tongue and tolerate the girl's disrespectful words towards me and towards her mother. The way it is supposed to work is the parents unite to work with the child, but in this situation Janet sided with her daughter instead and left me out. This relationship was doomed. Janet and I decided to give it one last try. Earlier in the year we had signed on for a ski trip together. 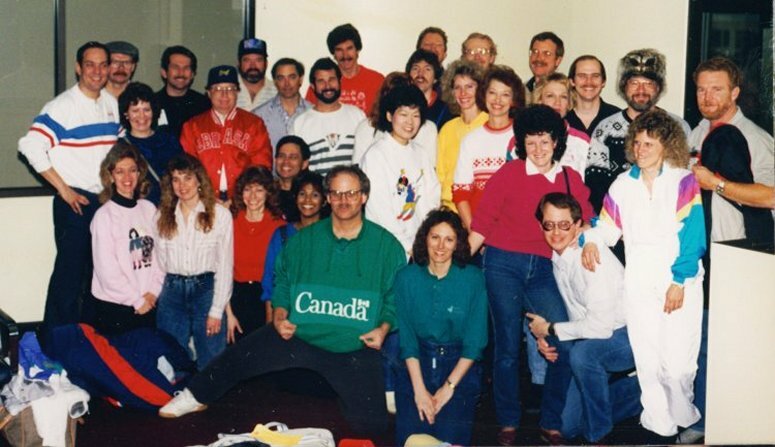 Adding to my discomfort, the same Exodus Gang that had gone to the Bahamas reunited early in 1989 for a gigantic 50 person ski trip to Banff, Canada. Actually, from my point of view, the ski trip was even tougher. 50% of the Bahamas Trip were people who had left the studio. 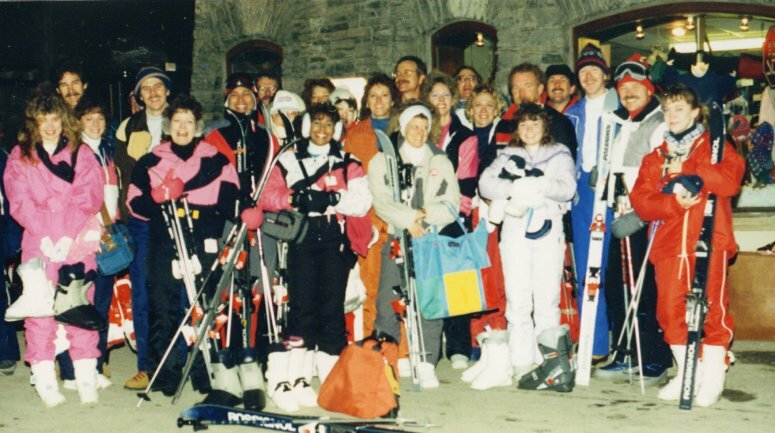 But except for Sharon and Janet, practically every single person on the Ski Trip was a Third Generation studio dropout. That's right, I was flying to Canada with 48 of my best friends who had left me. 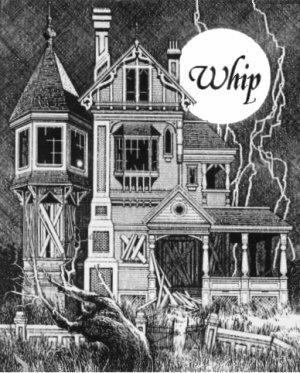 As the January 1989 trip approached, things weren't looking very good for me - I had a failing relationship with Janet and a group of people who presence constantly reminded me that I had once been their teacher until the day they discovered I was only the second best Whip teacher in the city. I was really grouchy. Better buckle your seat belt, Rick, it's going to be a bumpy ride. Take a quick look at that picture above. Every person in that picture (except a nanny along for the ride) met each other by taking lessons at my studio. Does that help clarify why I was in a bad mood? They are all smiling... but not me. Guess how many people in that picture were still taking lessons from me? Zero. Not one person was a student any longer. Beware the dangers of signing up for a trip six months in advance! Things might be different when the trip starts. On this trip, SSQQ had five letters instead of four.... X-SSQQ. Similar to the previous summer's trip to the Bahamas, on the ski trip I again had great difficulty being around my friends. Only this time it was much worse. My heart ached whenever I was around them. Seeing them having fun together hurt like hell, so I found it was easier to keep to myself. I know my behavior may not make sense. Why did I avoid these people? Let me try to explain. Let's say you have a girlfriend who leaves you for another guy. OK, that hurts. Except suddenly the two of you are on a trip and the other guy is out of the picture for a few days. The old girlfriend suggests we be 'friends' for the week. She isn't the one who was left. You are the one who was left behind. Every time you look at her all you can think of is that she left you for someone else. You can't turn feelings on and off. My feelings said my friends had left me. It was easier just to be alone. Meanwhile the tension with Janet was unbearable. Please don't misunderstand - I liked Janet a lot. We did not fight at all. We were very sensitive to each other's feelings. But there was an invisible presence in the room that put a wall between us - the knowledge that Janet's kid disliked me a lot. It was really hard to get past the sense that there was absolutely no future for us back in Houston. We talked and we talked, but neither of us could figure out a way around the problem. One night at the hotel in Banff, Janet and I decided to throw in the towel. We weren't angry at each other, but what's the use? We were just going through the motions anyway knowing we couldn't move past the impasse. Our breakup was actually quite civil. No tears, just quiet desperate frustration at our inability to find an answer. I had been in pain since the start of trip, but the Breakup made it worse. Now I was in a lot of pain. The word 'miserable' might apply here. I quickly discovered that the very sight of Janet brought me close to tears. It was difficult being in the hotel room knowing our relationship was over. I had to get out of that room. But I was also avoiding the rest of the group. I was avoiding the whole damn world! So what was I going to do to keep from going crazy? By chance, Sharon had recently given me a portable Radio Shack computer chess game as a Christmas present a month earlier. For the first time, I had decided to give the chess game a try on the flight up to Banff. I was fit to be tied when this chess game consistently beat me at some of the easiest levels. I was the unofficial high school chess champ and I was the undefeated chess champion of my dormitory in college. Therefore I was unaccustomed to losing at chess. However now on the plane ride I was losing with an alarming frequency. I was getting whipped like a rag doll. Once I overcame my shock, I became obsessed with mastering that chess game. Now that Janet and I had called it quits, each night after skiing, I would shower and change clothes, and then leave our room to find the most deserted corner of this vast hotel. In a huge remote sitting room I would find a big chair and curl up in it. I would sit alone playing computer chess for four, even five hours at a time. Each time a game was over, I would mark 'win' or 'lose' on a note pad. Sorry to say, the chess game stayed way ahead of me for the entire trip. Playing constantly, I won only about 40% of the time. But at least the chess game helped keep my mind off my real problems. Rumor had it that this ancient hotel was haunted. I wouldn't be surprised. It was a forbidding place indeed. Alone in the cold, vast dreary halls of this ancient hotel, I was sinking into a very deep depression. Dark thoughts filled my mind. I was growing numb. 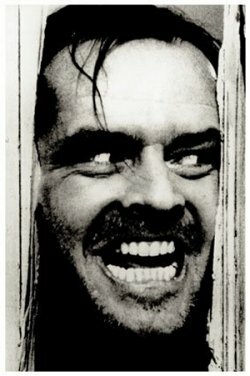 Think Jack Nicholson in 'The Shining'. On the plane ride home, I thought things through. This time there would be no "Dance Streak" to bail me out. I hated dancing. Losing my best friends to Southwest Whip hurt me deeply on two levels. Not only did I lose my best friends in the whole world, I had lost my best dancers as well. Who was I supposed to go dancing with? Dancing would not be a refuge for me. April 1989 marked the final bitter humiliation. Tom Easley was putting together his annual Surfside Beach Trip. This year the entire Southwest Whip crowd had decided to come down and join. After all, since practically all my Third Generation Exodus group were now taking dance lessons at Southwest, the veterans of past Beach trips talked it up to their new friends over at Southwest Whip Club. What a bizarre turn of events! Adding salt to my wounds, Janet would be there too. Rumor was she was dating someone from SW Whip. Janet was taking lessons at Southwest Whip Club just like the rest. I didn't blame Janet at all; after all it would be too awkward for her to stay at the studio. What choice did she have other than join the only other friends she had over at SW Whip? But that didn't mean I was happy about it. I missed Janet a lot and I was extremely jealous. Just because her kid didn't like me didn't mean I didn't still like Janet! And I missed Tom. I missed Mike. I missed Carol. And Ted. And Margie. And Bob Job. But they all had new friends now. Their new friends were people who were loyal to my business rival Mario. 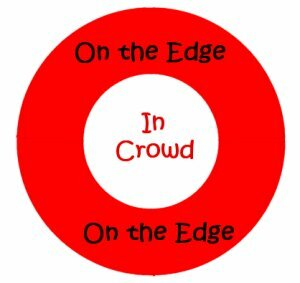 Although I was invited to join the old gang at Surfside, I did not have the guts to go down there as the "Odd Man Out" and hide my feelings for an entire weekend. I sure didn't want to watch Janet and her new boyfriend. I am not a masochist. As stories of the Beach Trip floated back to me, it was confirmed that Janet definitely had a boyfriend with whom she shared a cabin. Janet had nothing to apologize for, but the news still cut through me like a knife. It was the final humiliation that the entire world had to know I had lost Janet to Southwest Whip Club in more ways than one. Jim and Diane were gone. After the Bahamas, Banff, and Surfside, my best friends were gone. Now Janet was gone. It was so ironic that even though the studio was packed with students, I was unable to take any satisfaction. My heart was somewhere else. Each night when I came to the studio, in my heart the dance studio felt like a Ghost Town. My friends weren't there any more. Ain't no sunshine when you're gone. Only dark when you're away. Thank goodness Sharon stuck around. She was my saving grace that year. Sharon Crawford not only ran the business single-handedly, she kept me from going completely over the edge." "I heard there was one bright spot in 1989." "1989 was my Zombie Year. I pretty much mailed in my performance the entire year. Show up, teach, go home. I did my job, but without my previous enthusiasm. No serious girlfriends and not much social life after class either. After Sharon came to work for me full-time, I relied on her a lot more than I had a right to. Yes, thanks to Sharon, there was indeed one odd little bright note. As I neared my 40th birthday in October 1989, Sharon played an excellent practical joke on me. One day Sharon was over at the house to help me with the mailing list. She noticed this awful picture of me from the seventh grade laying on my desk. Thick glasses, cow lick, pathetic smile, busted front tooth - the kind of face only a mother could love. Sharon snuck that picture out the door, had it blown up and put on tee shirts. I knew the girls on the Staff were up to something because they kept laughing and hinting that I was in for a big surprise. But I had a surprise for them too... on the night of the 40th Party, I came out with an old man's mask on so they wouldn't see my face. Thank goodness I did wear that mask - I was flabbergasted by Sharon's practical joke! Thank goodness they couldn't see the shock on my face! Sharon got me good. A cursory look at the smiles shows how happy the girls were to participate in Sharon's clever trick. I have to say it was a cute idea. I never knew Sharon was that sneaky! 20 years later and I still haven't found a way to turn the tables, but someday I will get her back. Sharon, you better watch out! After my 40th birthday party, I sat back and thought things over. I knew I had pretty much had gone through the motions for the entire year. I was tired. I had put in eleven hard years at the studio. All the people save Sharon that I was once closest to were over at another dance studio. I had a failed marriage and two serious relationships in the past three years that had failed. I was lonely out of my wits. I shouldn't have been lonely. After all, there were a lot of neat people at the studio these days. In spite of my darkness, the Studebakers Gang was having a merry time of it. The problem was with me. Losing my friends had affected me in a way nothing could prepare me for. Now I was afraid to make new friends. Too many scars. The transitory nature of my unusual business had made me reluctant to open up again. All I could think about was 'Marriage is the Death of Dance'. What was the point of getting attached when someone might get married and leave? Or go to another dance studio? Or be forced to leave Houston to get a job? My previous warmth was replaced by a professional smile and a superficial politeness. I was bitter and I was cold. To add to my woes, my two beloved dogs, Emily and Sissy, both died of old age that year within one month of each other. Listening to sad Enya music, I cried my eyes out for days. It never just rains, does it? Even the fact that the studio was successful and completely established worked against me. I no longer had that struggle to keep me preoccupied. I had reached a plateau. Inside I was Night of the Living Dead. That old man's mask was reflective of my mood - I was totally burned out. As any career progresses, one of the toughest things to do is keep it fresh year in/ year out. The studio was established now and I wasn't a kid any longer. As 1989 drew to an end, 'Leader of the Pack' had totally lost its meaning for me. After my 40th birthday party, I crawled into a shell for the final couple months of the year. It was ironic that as the wild decade of the Eighties drew to a close, I probably spent more time with that computer chess game than I did with human beings. Other than Sharon Crawford, a computer chess game had now officially become my best friend. I took comfort in the fact that the chess game was unlikely to go to SW Whip." In our next chapter, we cover the events of The Nineties.